You can find attached a video showing the tronicgr dashboard.Tronicgr helped me to change the code (I worked on the code a little bit also ) ,because i would like a big 7 segments display for displaying the gear.In this video you will see a little one because it's for testing . 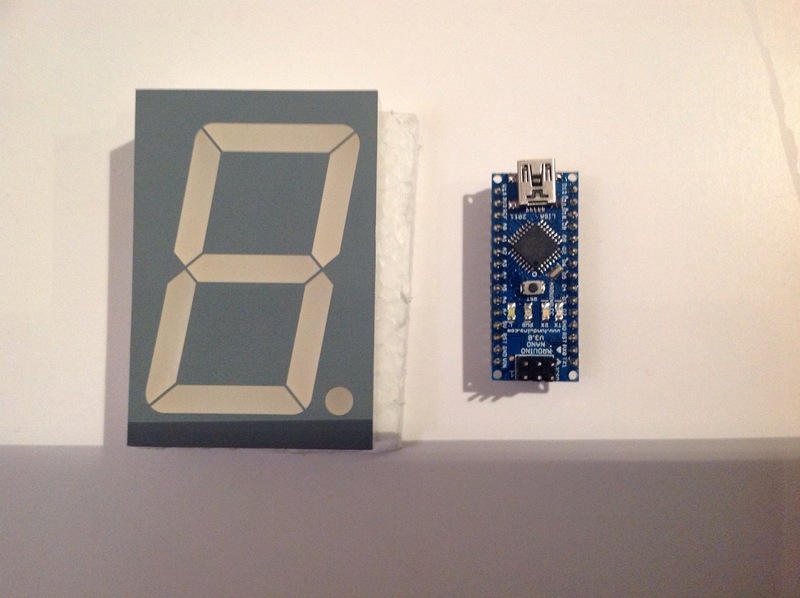 The gear display has a big size , see the photo from it near the arduino nano!! The last point ,but not the least, is that I would like to display on the tm1638 the speed near the rpm. After a several tries I achevied a good result with Thanos help. I will poste the code after removing all things unnecessary .I will post the shematic also because I used a decoder MC14543B for the 7 segments display(only 4 digit for displaying from 0 to 9).One thing is missing is the neutral "n" and reverse "r" that I still can't display ,but I 've got an idee.Just for,information the code works with 125000 bauds and 1 ms in uso parser. For information that's a video from tronicgr amc644 and 6 dof board. @ Prodigy: I have a little bit this problem but it disturbs me not so much. You changed for rpm from 500 to 1500 , I changed the value with 2000 and I think that's good for me. Last edited by vicpopo on Sat 2. Feb 2013, 16:27, edited 2 times in total. Great work Gilles! Also, nice from Tronic for helping you. Now your dashboard has a lot of wires and boards, how will you do a box for it? I am pretty pleased with TM1638 display, it has all I need right now and if I am going to upgrade, I think I will attach another TM1638 on it, maybe for fuel, laps, lap time or something like that. But for now I will stick with this one display, it is small enough so I will do a box and attach it to the wheel. I was playing with the ard. code and uso command, I have found a way to have LEDs synchronized with car without too much numbers changing. I have set RPM in converter to auto find max. number, and only thing I need to do after I change car, I need to reset the RPM math number to 1, and after that game will auto adjust RPM value for the car when you start driving and LEDs will be auto adjusted. Just press throttle once when in neutral gear to receive max. RPM. I think I will wait for new version of X-Sim to test the new auto adjusting feature. Maybe then there will be no changes needed every time when switching car. If that works good I will post the code and details. Last edited by prodigy on Sun 27. Jan 2013, 14:13, edited 1 time in total. Thanks for sharing your experience.I will try your tip. As I've got the beta 3.0.0.8 I could test it and give you a report. The last video with the big 7 segments display .I will post all the code soon. Last edited by tronicgr on Thu 31. Jan 2013, 01:40, edited 1 time in total. You've found solution for reverse and neutral. Below you will find a zip file .Inside I recorded the arduino program in txt ,the wiring schematic and the datasheet for the display. - the big 7 segments display needs 8 volts , I supply it with 9 volts. - the arduino nano V3 can be supplied with this voltage without problem when using the Vin input.It has its own voltage regulator. - I don't know if diodes are usefull but it works with them so I left them (I didn't test without). Beware: I made peharps a mistake , check twice if you use it and contact me. I would like once thank Thanos because without him and his code I didn't achieve making this project. Hello Thanos, I am Paco of Spain and my question is there is some way of converting the miles to kilometres into the program?. A greeting. PISTON24 wrote: Hello Thanos, I am Paco of Spain and my question is there is some way of converting the miles to kilometres into the program?. A greeting. Hello Vicpopo, which is what I have to change, you can indicate me in the code that I have to change. A greeting. /*For the europeen driver which would like the speed in km/h and not in mph just change the maximum value in the extractor input from 104856 to 65154 .You didn't give this information Thanos I believe.